The greatest challenge in water management is negotiating expectations of the multiple users — the farmers, the fisherman, the townspeople. It’s hard finding an agreement that meets the demands of cultural relationships, domestic users and commercial enterprises. Terrence Taylor, Vernon Yanner and Murray Walden survey the coastline, 2008. Carpentaria Land Council Aboriginal Corporation, Wellesley Islands, Queensland. This photo shows Gangalidda and Garawa rangers surveying the Gangalidda coastline. Introduced weeds such as rubber vine and the poisonous calotrope have become so thick that native trees and grasses cannot rejuvenate, which threatens the habitats of endangered wallabies, Gouldian finches and marine turtles. Across Australia’s diverse landscapes, different ranger groups are promoting healthy waterways. They are dealing with major issues, such as the decline in native vegetation, habitat quality, erosion, salinity and toxic algae in waterways. Rangers in the Torres Strait are surveying the seagrass beds and meadows that provide homes and breeding grounds for endangered species like dugongs, turtles, large migratory seabirds and shorebirds that are reliant on their reef ecology. 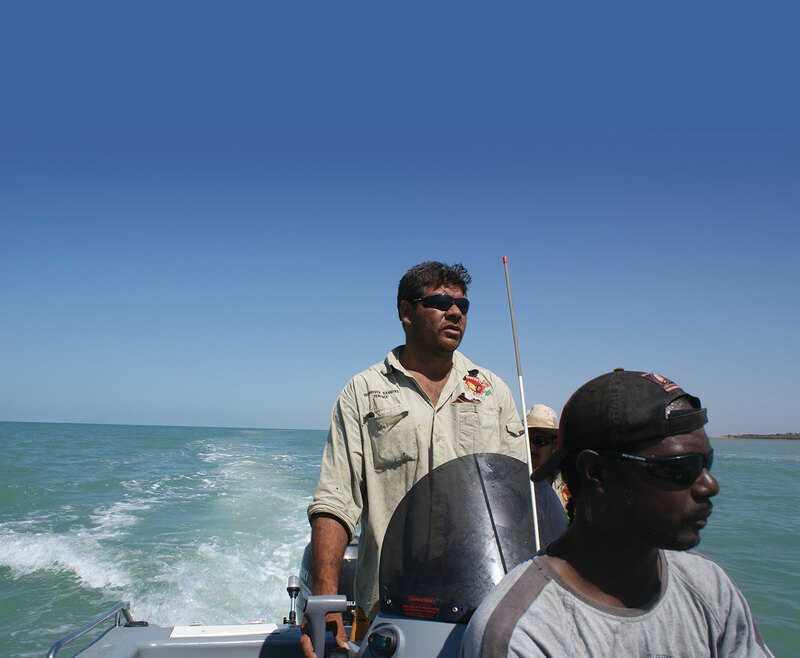 Yirralka Rangers and others along the coastlines of Arnhem Land and the Gulf of Carpentaria are clearing marine debris that brings with it potential disease and foreign pests. Drift nets, known as ‘ghost nets’, are a particular problem, washing up with marine creatures entangled within them. In South Australia, Ngarrindjeri Rangers are revitalising the Coorong, a world heritage listed site and major breeding ground for pelicans and marine birds unique to southern wetlands. The rangers’ revegetation program focuses on returning to a sustainable native plant population within the wetlands to manage salinity levels and support the native animal population.